Scout has been keeping track of restaurant openings for a very long time. Of course, not all of the spots we choose to preview are able to live up to their pre-opening hype, but most of them do. Today we isolate nine of these – our favourite new restaurants of the year so far – and present them in no particular order for our readers to rank (poll at bottom). Opened back in June, this casual counter-service addition to The Drive gained an immediate following on account of its deliciously addictive “Nashville Hot” style fried chicken. Don’t let the line-up freak you out; it moves fast! Order: chicken sandwich with the heat level set to “medium”. Secret Weapon: cornbread with honey butter. 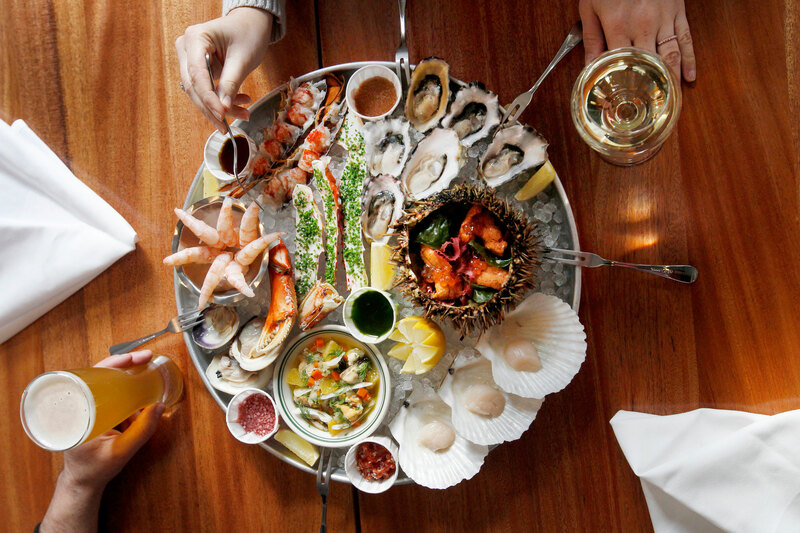 Launched in February in the old Secret Location address on Gastown’s Maple Tree Square, this seafood-focused sister restaurant to nearby award-winner L’Abattoir is on the sleek side of beautiful. Go in a group of four and request one of the cozy booths! Order: Captain’s Seafood Platter (pictured at top of page). Secret Weapon: “Bramble” cocktail. This modern-meets-classic reimagining of an old American-Italian spaghetti house (see “Nick’s” in Scout’s Restaurant Graveyard), opened in June to a packed house and hasn’t slowed down since. The charming interior design has plenty to do with this, but the food and service are also on point. Order: calamari fritti and veal cutlets. Secret Weapon: spumoni banana split. Granville Island’s new Popina is the collaborative effort of four great local chef talents that set out to do the very best versions of their favourite comfort foods. We’re talking burgers, falafel, fried chicken – you get the idea. Its waterfront location boasts a stunning view of the False Creek’s northern shore. Order: lobster roll. Secret weapon: puff creams. The new Kitsilano hangout from the same folks that gave us the neighbourhood’s perennial dinner favourite, AnnaLena. Some might say it’s more of a coffee-focused cafe than a restaurant, but if that’s the case why is the food so damn good? Expect plenty more from this concept as it evolves. Order: cronut and espresso. Secret Weapon: smoked meat breakfast sandwich. The team behind West Pender’s much-loved Cinara restaurant brought this casual Italian concept to Main Street early in the new year and it quickly found a dedicated following in the neighbourhood. The bright, unpretentious room is made all the more attractive by a simple menu of familiar favourites and unfussy wine list. Order: risotto of the day. Secret Weapon: vitello tonnato. Though just 9 months old, DiBeppe is the old timer on this list (and the first of the three Italian newcomers). It is already well settled in its Gastown location, looking like it’s been there for years and expertly churning out tasty antipasti, pizzas and pastas. Order: Spaghetti Amatriciana. Secret Weapon: tiramisu and cannoli. The colourful Chinatown location of this Vietnamese looker is bigger (54 seats) and arguably more interesting than the Yaletown original, sporting a much sexier design, a more deliciously diverse menu, and a full bar that is always pouring something good. Order: “Damn Good Chicken & Rice”. Secret Weapon: honey garlic beef banh mi sandwich. It took these guys a few months to find their feet in the old Habit/Charlie’s Little Italian address, but they’ve since emerged as a fun place for cocktails and Cuban eats. We dig the transportive tropical design, too, especially the back bar, which elaborately employs several dressing tables (“tocadors”). Order: Cubano sandwich. Secret Weapon: Bird Conspiracy cocktail. made it to the best new restaurants in all Canada, so congrats to them. DL Chicken Shack has the the BEST chicken sando I have ever had!!!!! ?? DDMAU in Chinatown has the best chicken wings I have ever eaten and the Mango salad is also one of the favorites. Well worth checking them out. ?? And also to see Marlin Ramazzini and Fito García. Sandy and Gabriel H. definitely have nothing to do with each other, OR with Tocador. C’mon guys you can do better. buddy you got busted posting bogus reviews on here and I bet half your 3 1/4 stars on yelp reviews are bogus too. 2 star cuban dennys? Had the chance to check out DD Mau last time I was in town and was not disappointed. Tried the Bun Cha as well as their chicken wings. Having tried the Phnom Penh wings before, I’d say the ones from DD are definitely on par if not better. Definitely worth your while and at a price that won’t hurt your wallet. You would hope being owners of a restaurant and passionate about food and drink that we would be a bit more creative than to write out the same comment twice, have a think about it Mr Ghost. Now let’s talk about Cuban Denny’s, I can see that working for sure , I would be there in a heartbeat for breakfast. Thanks for this, we will always be grateful to you for this idea. We were running out of creative thoughts for our next venture. Cubano and mojito for breakfast, count me in! We will hope to see you there. Just please make sure to leave us a 6 star review. ? DD Mau’s food is … not very good. I hope you put it on here because you’re friends with the owners.